First, I want to disclose that I am extremely biased about President McGowan. Personally, I am very blessed to be a Bellarmine alumni from the class of 1989, and I see the pride that my brother Ray has as a graduate several years before that. The dates matter because 1990 was the year a young first time president and unproven visionary leader named Jay McGowan (who was only 45 years old) walked onto “the high school on the hill” (as many called it to my dismay back then). I later became a member of the Board of Overseers for six years and I had the opportunity to see the intimate side of his leadership style up close and personal. The things I learned from President McGowan are immeasurable. 1.) A great leader must create a vision that is clearly understood by all vested parties from day one so everyone knows what is at stake. Most of us could recite 20/20 vision framework because he painted the full canvas early so we could all see it! 2.) A great leader blends the rich heritage of the past through respecting it greatly, but couples it with the unlimited hopes of the future, so you never lose anyone along the way and everyone can then share in it! I remember crying with alumni from the 1st class in Springfield, MA at our 2011 National Basketball Championship and Jay made us all a big part of that magical day. 3.) A great leader will raise his office and duties to the highest moral and ethical standards possible so the role and office are enhanced to the highest level of accountability. 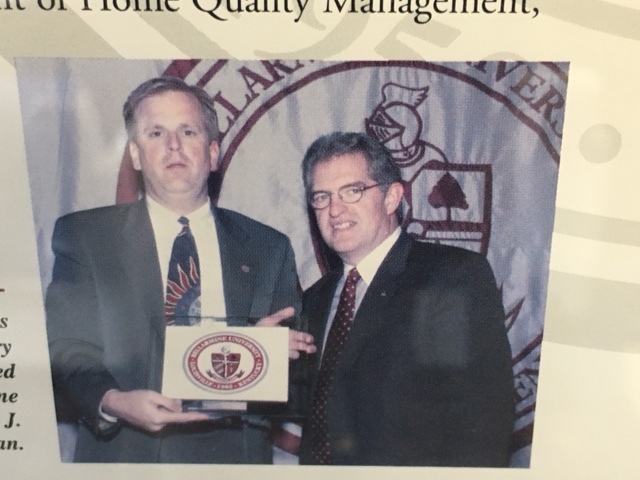 Bellarmine has been a model organization with amazing board representation and record breaking results for 26 years. 4.) A great leader builds great teams through “shared vision”, providing high autonomy for their teams to grow and flourish around them, and ensuring the responsibilities and autonomy are evenly matched so engagement is maximized. 5.) A great leader celebrates the success of everyone around them so we all enjoy the journey and not miss the sacred moments of presence. Every Bellarmine event was a celebration of our people’s “faith and works”. My induction into the Gallery of Distinguished Graduates with Jay by my side is still top moment for me and my family. 6.) All leaders must have deep subject matter expertise but the great ones are renaissance men who have the spirituality, the cultivation, the passion for the liberal arts, and the world views that intersect their eco system together in a very rich way. Every conversation for me was truly just new “learning jewels”. 1.) Dr McGowan presented a bold compelling vision called “20/20 vision” that left many confounded on how a small successful liberal arts college could make these bold moves so quickly and he never missed a target since those early talks. 2.) As a small university, I did not realize the amazing reach Bellarmine already had that was way beyond Louisville. Cars pulled up to the circle driveway from various coastal spots everywhere to be part of “our special place” that is inside our hearts, but was never a destination for Bellarmine people. 3.) I knew that if he was right, and it all could become a new reality, there would never be a better legacy to leave behind than his 20/20 Bellarmine Vision masterpiece. This changes everyone who touches it and expands our reach now internationally. Since Dr McGowan is now sitting with Saint Robert Bellarmine, it will be our job to finish the last few pieces in his honor. Thank you, President McGowan, from the entire Bellarmine Family.